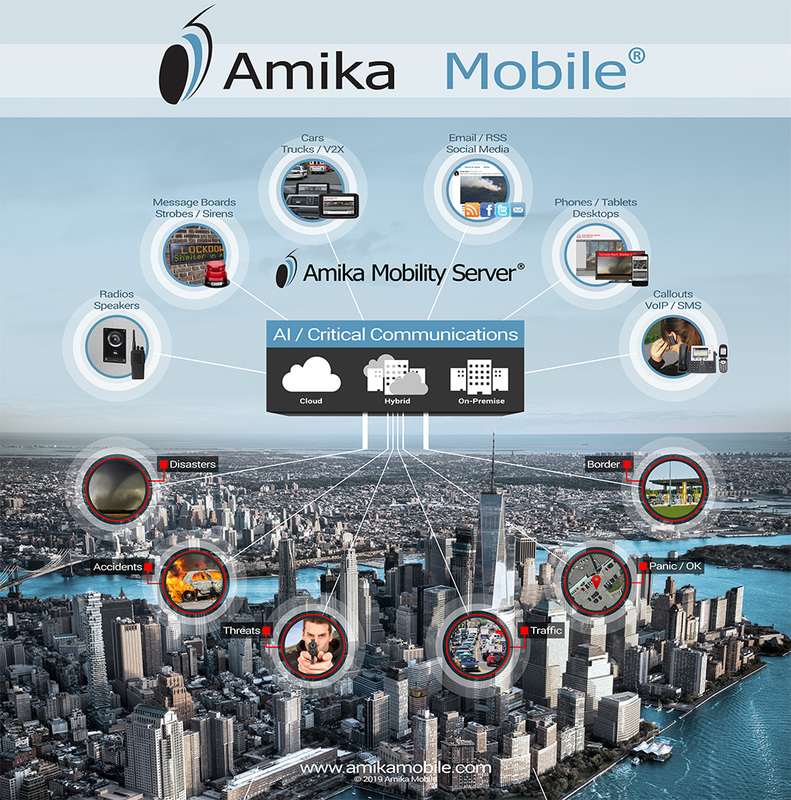 OTTAWA, CA / ACCESSWIRE / April 5, 2019 / Amika Mobile® is pleased to announce that its Amika® Mobility Server (AMS) platform for critical and emergency communication has been selected as the Best Emergency Communication Solution by Security Products and Security Today Magazine for the fifth year in a row after having won in the same category since 2015. AMS was selected for this award as it continues to push boundaries of innovation in crisis communications by innovating on its AMS platform to expand it further with AI and IoT for public safety and security in Smart Cities. This builds on Amika Mobile®'s partnership announcement with Dell in September 2018 to take the AMS to Smart City Edge Devices for FirstNet. ''GOVIES 2019 is continued amazing recognition for Amika Mobile as we push boundaries to save lives. Our AMS AI platform has continued to evolve so that it can instantly take in IoT sensor events and trigger Lockdowns with voice-overs and 2-way communication alerts if gunshot or threat is detected using our intelligent transaction engine. Expanding this for Smart Cities means that the sensor event could come from a vehicle, a border crossing, a camera on a traffic light or within a building making this a very complex set of events to quickly analyze and interpret to save lives. '', said Amika Mobile® Co-Founder/CEO Sue Abu-Hakima. Amika Mobile is a pioneer in technology that targets two gaps in public safety and security. First, AMS automatically discovers wireline or mobile devices by location − especially important for airports, sports arenas, entertainment venues, campus and communities where stakeholders and visitors must be given clear instructions based on where they are when an emergency strikes. Second, AMS automatically detects and intelligently manages dynamic sensor events triggered from disparate physical security systems mapping locations as the critical situations unfolds and IoT sensors deliver the cascading events in real-time in Smart Cities or anywhere else. AMS automatically interprets and delivers the information to appropriate security teams at command centers or while mobile in a vehicle or on foot or in a building. Amika Mobile® has delivered such ground-breaking solutions to customers for 9 years. MarketsandMarkets forecasts the Incident and Emergency Management Market to grow from USD 93.44 Billion in 2018 to USD 122.94 Billion in 2023. This growth is driven by many factors including increased terrorism, workplace violence, active shooters, natural disasters and heightened awareness of the need for critical and emergency communication during a crisis. Amika Mobile will demonstrate its award-winning AMS products at GSX (ASIS 2019) booth #2622 in Chicago, IL, NCS4 booth # 613 in New Orleans, LA, CANASA booth #503 in Ottawa, Canada, and WBENC 2018 in Baltimore, MD.